Regular readers have noted a distinct lack of blogging in recent months (thanks to those who emailed in to enquire if I was still upright!). POD has been super busy working with the Westfield Carindale design team on the development and delivery of a brand new casual dining precinct that includes Grill'd, Guzman Y Gomez, Wagamama, Ginga, good coffee from Veneziano, a totally new look Toscani's, Yum Cha, a Belgian chocolate shop and more (the locals are loving it!). Four days after this new precinct opened, the Wintergarden redevelopment in Brisbane's CBD also opened (lots of VM pics below on that one), and with no more than about 40 winks of sleep I found myself lending a VM hand at Westfield Fountain Gate (Melbourne) over the past few weeks. Given the very long list of 'boxes ticked' over the past few months you won't be surprised to know it took a very strong flat white to get fired up today and file these stories! Stage 1 Westfield Fountain Gate redevelopment opened last Thursday. 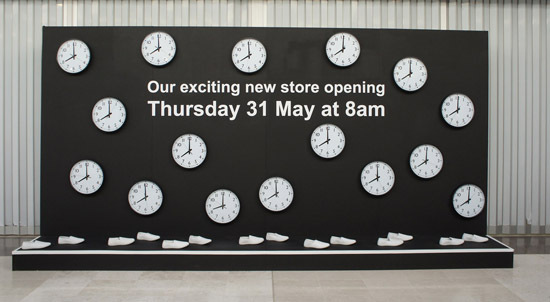 Anybody in the know knows there are always last minute challenges in the count down to any opening. Within 3 hours of team POD getting on the phone to find a temporary staging solution the seriously good crew at Staging Rentals were on site and installing a 5 metre wall and dais for us to dress (no small feat considering it needed to be painted and the drive from their warehouse to the shopping centre consumed 45 minutes of this time frame). With a temporary VM space in place the POD bods (that would be me, RG Productions and Comer & King) took ourselves off to KMART and found these fab clocks ($10 each!) and some white sneakers we nailed to the floor for the purpose of stopping enthusiastic short people running across the platform. We had it all installed just as the paint was drying. Normally I wouldn't mention such a mini VM fix but I am telling you this because the customer service at KMART Fountain Gate was fantastic. Having recently experienced an appalling "service" moment at a Myer store (so offensive I promptly put down the $600 I was about to spend and walked out of the store). The contrast between the two moments could not have been greater. I can't remember the name of the 'meet and greet' lady working the night shift at KMART but she went and found me a trolley, the young lad who 'heard' there was a lady in a lime green safety vest in the store looking for cookie jars tracked me down in the aisles and helped me find more stock, the young girl at the self serve check out who took great interest as to why I was buying 16 clocks and enquired if she could help carry them to where they were going (how nice is that?!). Great attitude and a fab floor team - go KMART F/Gate! Rather than a hoarding on the lease line POD pushed back to create a small seating zone next to Ivan's Deli. 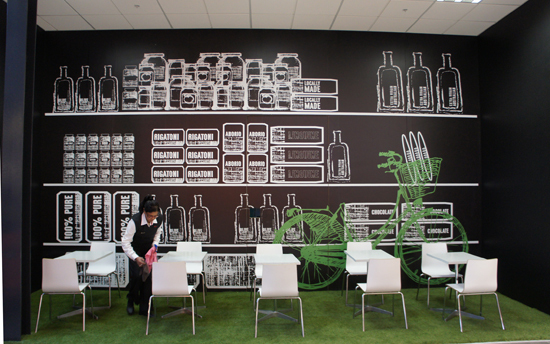 Over sized olive oil bottles and popular deli goodies created visual impact for this temporary zone in the new Fresh Food Market at Westfield Fountain Gate. A sushi sun, ribbon sandwich sunflowers, taco and burger butterflies and espresso flower pots ... more creative concepts from POD to promote the new Wintergarden food hall. Vinyl print and install by Forbes House, Brisbane. I hope the shop fitter realised he had some big shoes to fill here. Wintergarden Stage 2 hoarding creative by POD. Print and install by Forbes House. Photography by Steve Ryan. A challenge with every shopping centre redevelopment is the various stages of re-opening and how to ensure the areas still under construction look as fab as the newly finished shops. 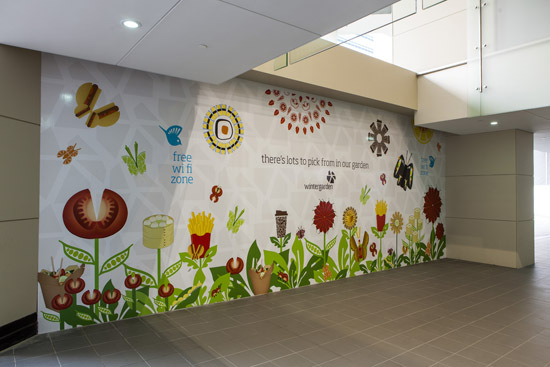 POD was given the opportunity of developing the creative and delivering the visual merchandising for Stage 2 of Wintergarden. With the advertising campaign line come play in the garden as our only mandatory, we decided to let the garden go to our head in this location! Brilliant installation and design assistance by leading interior designer, Cameron Comer of Comer & King. Photography by Steve Ryan, Rix Ryan Photography. I'd say this is one of the fairest looking hoardings of them all ... creative concept and mirror embelishment by POD. Big thanks to Forbes House who did a fab job of printing the vinyl and putting it up on the wall. As seen in Wintergarden, Brisbane. Photography by Steve Ryan, Rix Ryan Photography. POD has recently completed the concept development and branding for a quick service food outlet that can be found in the food hall at the new look Wintergarden in Brisbane's Queen Street Mall. Fresh and fabulous South East Asian salads, rice paper rolls and iced teas are being served up at Ms Chi Qi (pronounced Ms Cheeky). Brisbane readers should pop in for a Peking duck wrap, prawn rice paper roll or a thai beef salad ... it's v. good!